If you ask discerning prop collectors now as to who makes the most accurate helmets and armor, its quite likely they're going to respond with "RS Prop Masters". Here at StarWarsHelmets, we've already run reviews on their excellent ANH/ESB Stormtrooper helmet/armor as well as the recent RotJ Scout Trooper helmet - an on both occasions can verify that if screen-accuracy is your thing, then you don't need to look an further. 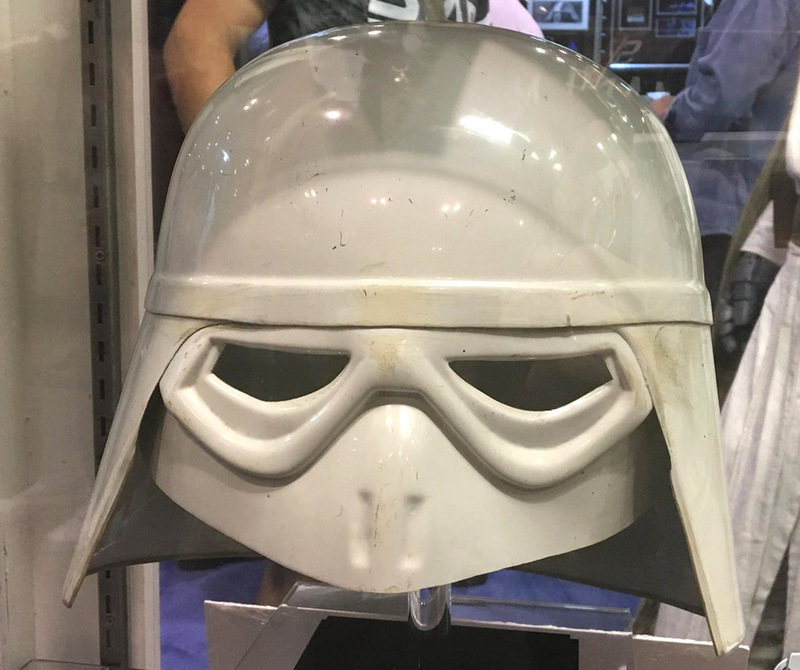 So to tie in with our new page on the original screen-used Snowtroopers, we're taking a close look at RS Prop Masters new ESB Snowtrooper helmet to see if it lives up to the hype. As background to this, a couple of years ago we learned that the team behind RS Prop Masters were successful in buying an ESB production-made Snowtrooper helmet at one of the high-profile UK auctions. They've subsequently used that helmet to create a new master mould - and these helmets have been vac-formed from that mould. So these helmets have clear lineage to the helmets we see on-screen - and looking at them you that's evidently clear. 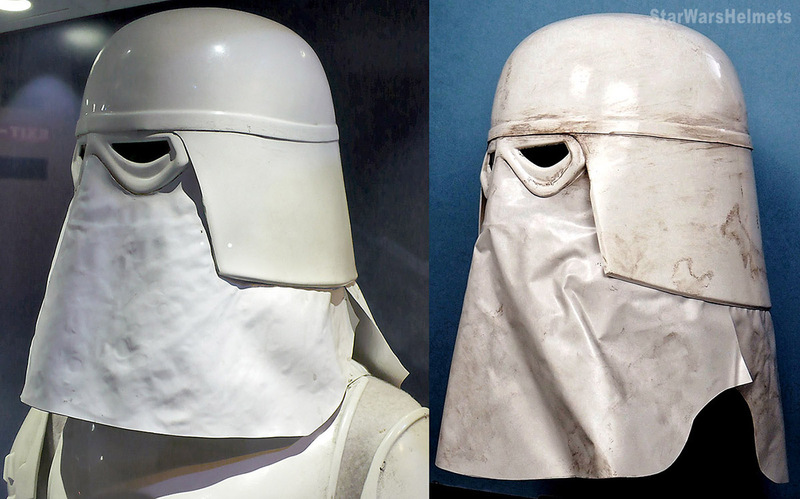 Above a comparison against one of the original screen-used Snowtrooper helmets (the original left, the RS Prop Masters right). Note that it's not a perfect set-up as the helmets weren't side by side (plus the original is pristine as opposed to the RS's is weathered). But either way it shows how accurate this helmet is - and again fully demonstrates why RS are seen as the leading helmet makers right now. Above, a nice front-on shot of the RS's "Alan Flyng Signature Edition" Snowtrooper helmet in all its glory. Alan had a number of roles including both Stormtrooper and Snowtrooper in ESB - so its cool that RS approached him for this particular helmet. RS also does a pristine version of the Snowtrooper - but we love the look of this particular helmet and the way it matches the grimy, weathered appearance of its on-screen counterparts. Above a shot of the production-made helmet RS used as their master (minus its PVC vinyl face cowl). When you compare this to RS's finished helmet, you can see what a great job they've done matching both the overall dimensions, as well as the specific detailing such as the cuts around the eyes, and down the sides of the helmet section. Above a view looking down from slightly on high. The PVC vinyl is fairly thick but still quite flexible enough that you can move it around if you're trying to match a specific on-screen helmet. Note that on top of the Signature Edition shown here, RS are also producing all-white pristine helmets. Above and below a couple of shots from the side and rear. Like the originals, the RS Prop Masters replica is made from the vac-formed ABS sections; the dome, lower helmet (which wraps round joining to the dome along the seam) and the goggles/beak section. These are then glued together and the two-part cowl/rear sections of PVC vinyl added. Below another beauty shot of this superb helmet. If you're interested in more background info on the original screen-used Snowtroopers then then check out this new page which explains how George Lucas' ideas were visualised by designs by Ralph McQuarrie and Joe Johnston - and then realised in John Mollo's finished costumes. Side shot - nothing much to add here. Its difficult to see from these shots but the helmet as the usual green acetate "lens" material behind the eyes (same as the Stunt Stormtrooper helmets). Below, the overall package you get with the "Alan Flyng Signature Edition" is really great and further enhances its collectability - not least as its limited to just 100 helmets. The pack includes the weathered helmet itself, signed and numbered plaque, display stand and edition photo. It's really pleasing when the smaller, artisan companies are able to match the quality of the overall package that the licensed producers produce. In fact its more than that - since from a screen-accuracy perspective, RS Prop Masters are a country mile ahead. Below a couple of shots of it next to an RS Prop Masters ESB Stormtrooper helmet. We're going to do some side by side comparisons against the Anovos Snowtrooper soon - but in this case we just thought it might be interesting for those wondering about its size and colouring, next to a Stormtrooper helmet. Looking at these two side by side there's no doubt that the 'Cloud-City pristine' Stormtrooper and the 'Hoth fire-fight' Snowtrooper make a very nice combo. Like the other RS Prop Masters Stormtrooper and Scout Trooper helmets we've reviewed, they've used an original/production source helmet for the mould, replicated the manufacturing process and materials exactly - and delivered a completed helmet which in years to come will probably cause much head-scratching from those trying to differentiate it from an original. So in summary its great to be able to report that this is another really superb helmet from RS Prop Masters - who have again demonstrated just why they're seen as the leading producer of ultra-accurate Original Trilogy helmets. Over the years there have been very few Snowtrooper helmet replicas made, let alone one with this level of accuracy - so collectors now at last have the chance to finally nail this illusive character.